When a child sits down to write at a desk, it can be easy for everything to go awry and messy, illegible handwriting to result. It might be poor carryover of handwriting skills, difficulty with letter formation, visual motor skills that are not up to par, or weak fine motor skills and pencil grasp struggles. The issue with sloppy handwriting is that there is a LOT going on! One tip to check as soon as a child sits down to write, is their posture. Everything from head positioning and visual view of the writing space to positioning of the arm and hand on the paper stems from the midline and base of support. 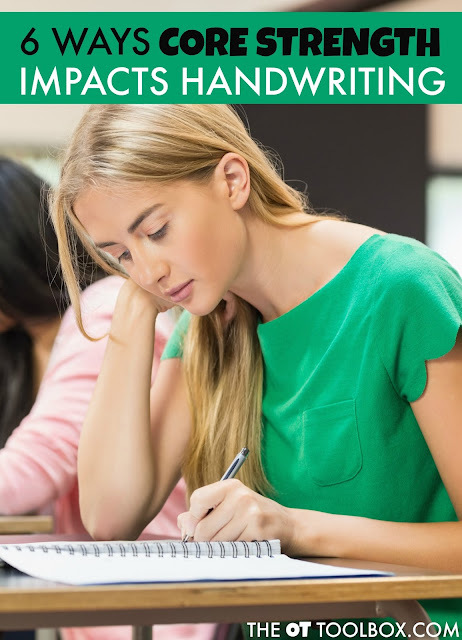 Because of this, I wanted to share ways that core strength impacts handwriting. The child with weak core strength may have sloppy handwriting that just can't be fixed. Band-aides of pencil grips, specialty lined paper, and handwriting modifications can help improve written work, but when a weak core is holding up the child, the handwriting struggles will never be fully fixed. It is so important to start with the midline and base of support when it comes to handwriting. That proximal beginning of assessing the child can make a world of difference with just a few adjustments in posture and strengthening. When there are handwriting problems, there are underlying issues that cause them. Core strength is a big cause of handwriting struggles. 1) When a child has a weak core, they may tend to sit with a modified base of support. They might slump over at their desk and lean on their elbows. You might see a slouched back, knees and legs sticking out between the rows of desks. You might see kids who are slumped over their papers or are leaning on one hand as they write. You might see the child lying forward on an extended arm that reaches over the front of their desk. An inefficient posture can lead to poor handwriting. Read more about a 90/90/90 posture and how to promote that posture using cue cards. 2) Classroom teachers will say they often times see students who are not active and alert during school tasks. A weak core can transition to inattention and inability to focus on learning or handwriting tasks. A core strengthening plan can help this problem. 3) When the core is not engaged, the child's non-dominant hand can not support the paper. When this happens, the paper isn't stabilized and legibility can suffer. Coordinating both hands together with an engaged midsection requires a strong core. Read here about tricks for holding the paper when writing. 4) A weak core can lead to a child who can't engage their muscles over a period of time. This looks like a child who wiggles, moves in their seats, jumps up, and slouches. With all of that wiggling and moving, handwriting can suffer! 5) Copying a list of words from a smartboard, book, or homework assignment center across the classroom or desk requires visual shift and the ability to quickly scan using visual perceptual skills. When a child who has weak core tries to copy a list or sentences, they might present with a slouched upper back and neck over their desk. Looking up and back down again can be really difficult for these students with the repeated flexion and extension of the neck. This can result in skipped words, letters, and phrases as well as poor margin use, line awareness, and spatial awareness when writing and copying written work. 6) A weak core leads to weak fine motor skills distally. The engaged and strong muscles of the abdomen and upper body allow for strength and engagement of the upper arm, and in turn leads to dexterity and motor control of the hands. When the core is weak the hands can not effectively do their job to hold the pencil and manage tasks such as in-hand manipulation. What should you do when weak core muscles impact handwriting? 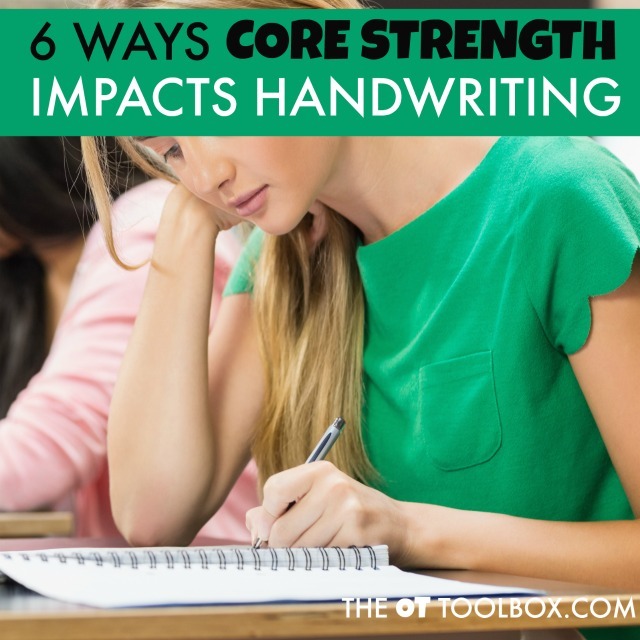 Strengthening the core can have a HUGE impact in handwriting! Use the strategies and tips in The Core Strengthening Handbook is a resource for fun and creative core strengthening activities for kids with awesome exercises, games, and activities designed to give kids the strong core foundation they need to improve handwriting. The Core Strengthening Exercise Program to help make core strengthening fun and entertaining for kids while promoting carryover in the classroom and when writing. 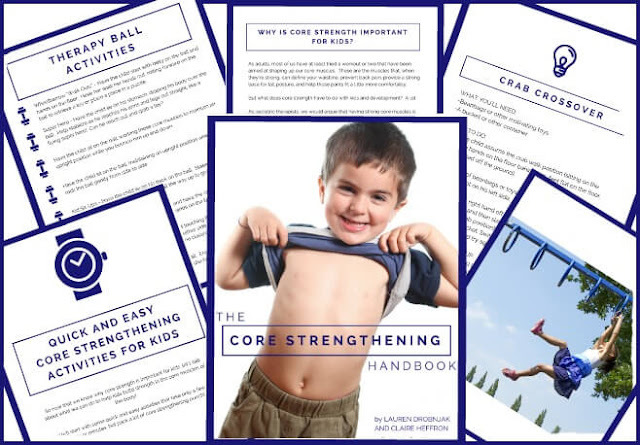 The Core Strengthening Handbook has everything you need to know outlined into informative strategies and tips that work to meet the needs of kids of all kinds! Get your copy of The Core Strengthening Handbook HERE.